Last month we have decided to give out a try of the latest Storj DriveShare GUI and to participate in the beta testing of the service. We also wanted to check out the rewards that people are getting in return for their help in testing out the network and today Storj will be distributing the next bath of rewards. We have participated in the test for about 20 days with 100 GB of space shared on the network and according to the data published our reward for helping test the network in January is a little over 12 SJCX coins with about 94% uptime for the time duration. With the current StorjCoinX exchange rate this is about 115000 satoshi or about $0.45 USD, it may not seem that much, but do not forget that these are rewards for beta testing the service. Sharing more space for longer time with better uptime should bring you more rewards, though this should give you an idea on what to expect should you decide to help with beta testing. 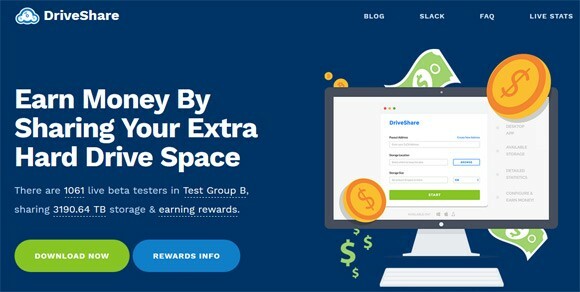 What you should know is that helping with beta testing won’t be that much profitable, but once the service officially launches what you get back in return for sharing your free hard drive space should be more rewarding. For the moment however the users beta testing are required to purchase at least 10000 SJCX in order to be eligible for rewards and the rewards themselves are not that big unless you share a lot of space. The people sharing 25 TB of space each for the service are apparently getting about 1500 SJCX coins as a reward. So getting into the beta testing phase and participating in the reward program is more for people that do believe in the service and as a kind of a long term investment as well. You can of course participate in the testing of the service without having 10000 SJCX in your wallet, however this way you will not be eligible for receiving rewards for your help and support. So if you are interested in checking the service out you can head on to the official DriveShare website and download the GUI version of the software. The number of unique participants in the beta testing of the DriveShare software in January is 533 that are eligible for rewards according to the official published rewards list. The list also includes 1222 more users that do not have 10000 SJCX coins in their wallet, meaning that they are participating without receiving rewards. As a comparison in December last year there were 420 unique wallets participating with at least 10000 SJCX and receiving rewards and 711 more that were not eligible for rewards. For November the numbers were 352 and 663 respectively, for October there were 342 and 393, so there are more users joining and helping test the service. Last week the service has announced the reach of another milestone in their testing phase, passing 2 PB of total storage shared and now it is already over 3 PB of storage shared. Great article as always. There’s a small typoo though, it’s 2 and 3 petabytes (PB), not TB. Sorry, but this does not seem worth the hassle until the rewards are better. I think you are going to lose money currently after electric costs.